Locals allege that such lorries drain waste water into canals which connect Periya Eri in Tiruneermalai to Adyar River. 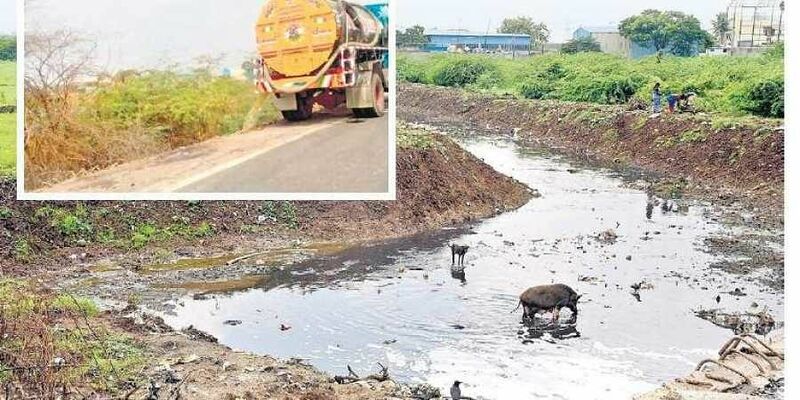 CHENNAI: In 2013, Pughal had first noticed a private tanker lorry parked along Tiruneermalai High Road discharging foul-smelling liquid into the Adyar River on his way home from college. Thinking that it was a one-off incident, he ignored it. But to his surprise, in the following years, such occurrences were only increasing. Six months ago, when he caught one such lorry at the same spot he found out that the discharge was untreated chemical waste from industries located in the SIDCO layout at Thirumudivakkam. “When I questioned the lorry driver, he nonchalantly told me not to worry as it wasn’t sewage but industrial effluents. I was shocked that the river was polluted by such toxic matter. The frequency of this activity has only increased in the last five years,” said Pughalventhan Venkatesan, a resident of Kundrathur. Locals allege that such lorries drain waste water into canals which connect Periya Eri in Tiruneermalai to Adyar River. “One week ago, I spotted a private tanker with a sign which said ‘Drainage Lorry’. When I enquired with the driver he said it was coming from nearby industries in SIDCO layout. The water also smelt like chemicals. They come either early in the morning around 6 am or in the night around 1 am,” said Yogesh S, a mechanic who has a shop on the same road where this discharge occurs. When Express contacted officials from Tamil Nadu Small Industries Development Corporation (TANSIDCO), they confirmed that three electroplating plants in Thirumudivakkam often dispose of their chemical waste through private lorries. “Majority of the industries within SIDCO manufactures automobile parts and don’t have any liquid chemical waste. Because of this, we don’t have a treatment plant to treat the effluents. The few electroplating plants within SIDCO hire private lorries to dispose of their waste elsewhere. But I am not aware of which location they do this,” said an official from SIDCO. “We weren’t aware of such activities. This is illegal and extremely harmful to the environment. I will raise this issue to higher officials and we will work along with the police and pollution control board to stop this immediately,” said Rajagopalan, member of Industrial Estate Manufacturers Association (TIEMA). A month ago, Pughal wrote to the Tamil Nadu Pollution Control Board (TNPCB) regarding this issue. TNPCB replied that chemical waste from nearby tanneries and industries are being let into the river after it is treated at a private company’s Common Effluent Treatment Plant monitored by them. “I used to work at a chemical coating plant in SIDCO in 2014 for a year. I personally knew that many industries within SIDCO do not treat their waste and dump it in nearby water bodies. Such effluents are highly alkaline as these are residues of solvents such as sulphuric and hydrochloric acid which are used to remove rust from metals,” added Pughal. CR Balaji, a civic activist had also raised a similar complaint to TNPCB in December 2017 about alleged sewage and chemical discharge into the Adyar River at Tambaram-Maduravoyal by-pass near Tiruneermalai High Road. “Officials said that they had inspected the spot and found only treated sewage being discharged. They added that effluents were treated at the Pallavaram tanner’s effluent treatment plant. But waste dumped by lorries are usually not treated. The stench near this area smells of sewage mixed with chemicals,” said Balaji.